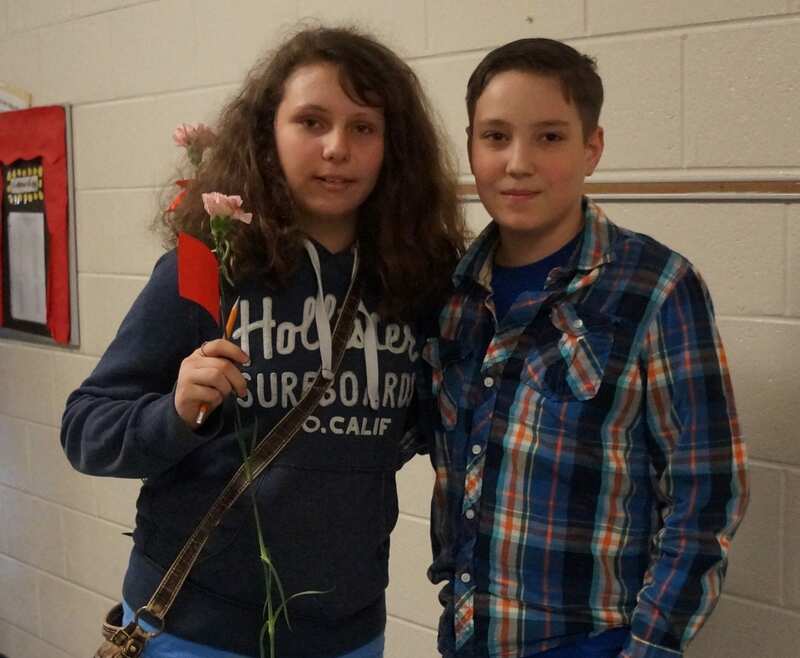 JASPER, Ga. – Many see Valentine’s Day as a day to show a little extra effort toward someone special. It is a day set aside to spend a little extra effort to show someone they are special and worth the effort. Regardless of how or why it was created, it is generally a special day for those who celebrate it. You, like me, may think about love and this day while having someone specific in mind, a significant other, a family member, or something of that sort. Look around and you can find all sorts of reminders of romantic and amorous love. But once in a while, someone will come along and remind you of true compassion for others, a love that supersedes the romance that can give us tunnel vision. Enter Aden Fillion. 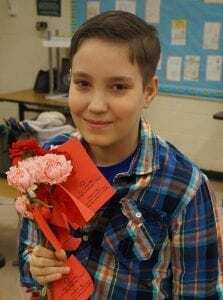 He is a sixth-grader in Pickens County Middle School (PCMS). And last year at Valentine’s Day, Aden got an idea. As he looked around his classes on this day, he began to notice something that bothered him. Not every girl was getting a candy gram for Valentine’s Day. On a day that is meant to show how much love there is in this world, there were girls in his school that were “left out” as he says. When he noticed this, Aden said he felt the pain: “When they felt left out, I felt left out.” It was something he couldn’t stand to see. The thought came to Aden that he wanted to make sure every girl got one of these candy grams on Valentine’s Day. Aden Fillion, left, stopping for a photo with his mother, Jessica Fillion, right. Though he didn’t speak of the issue right away, the thought stayed with him until September. Speaking to his parents, Jessica and Clint Fillion, Aden revealed his hope for this year’s Valentine’s surprise. After debating on how to accomplish this feat, Jessica eventually decided to try setting up a GoFundMe page. She admits now that she wasn’t too sure about how much success the page would get. Two days later, $300 had already been raised for Aden to accomplish his plan. A feat that shocked Jessica and emboldened Aden. With everything ready, the Fillions needed only to wait until this month to place the order, keeping the secret until now. 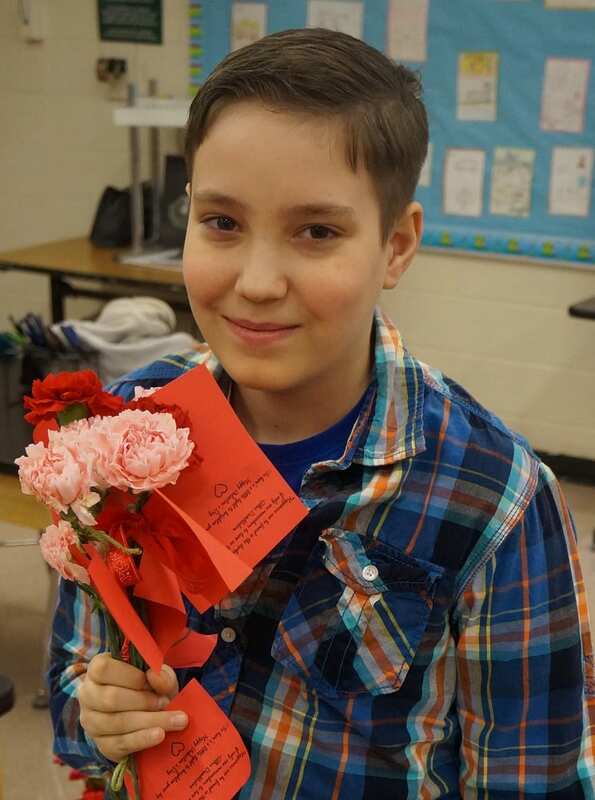 Aden stops by the front office to deliver flowers to the front office staff of PCMS. 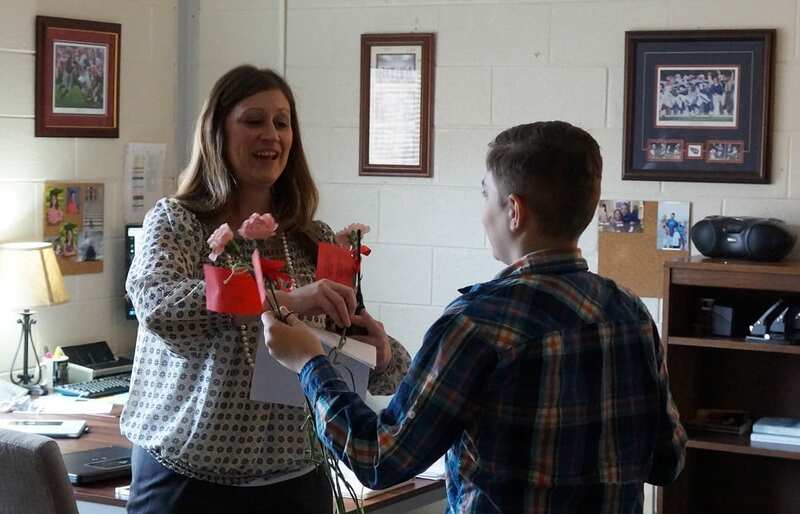 While in the past, the counselor’s office has handled candy grams, according to Watters, this year changed as the BETA club decided to handle the Valentine’s items. Thinking about February as Heart Health Month in addition to Valentine’s Day, BETA decided to do carnations instead of the candy grams. 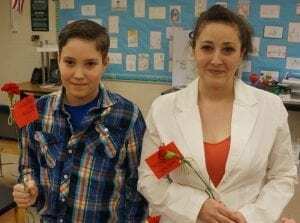 As Jessica and Aden began talking with Watters about Valentine’s Day and what he had planned, they began planning and ordering for all 225 girls in PCMS. 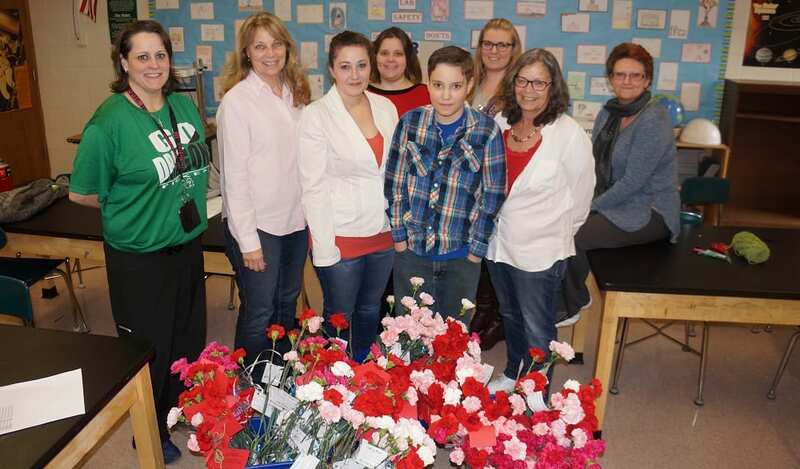 There was only one issue – last year’s candy grams cost $1, but this year’s carnations cost $2. As of today, few people have been privy to this plan, but every one of 225 girls is walking out of their middle school today with a carnation, and a reminder of the love that people can have for each other. Through community support and a little help from BETA, Aden’s plan has been fulfilled, and one student reminded everyone of what we can accomplish for each other. Aden begins delivering flowers with a personal friend Harley. 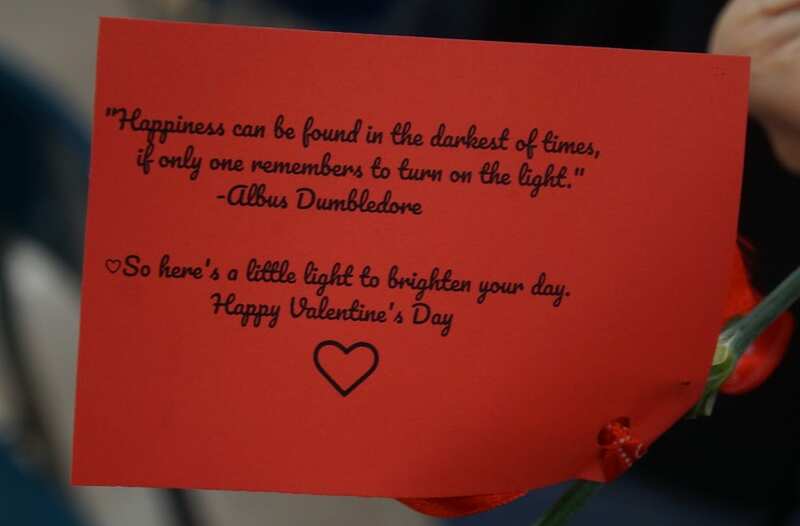 Each flower that he sent came with a note attached, “Happiness can be found in the darkest of times, if only one remembers to turn on the light.” A quote from Albus Dumbledore in the book, and film, Harry Potter is a note from Aden and his mother’s favorite movie to explain his hope for those of his class, a note of the happiness he wanted for them. Aden you are awesome. We need more people like you!